I really enjoy Thai food and have rarely dabbled in making it at home. It is far easier just to order it in, or so I thought. I recently took a Thai cooking class given by the dynamic, Chef Phensri of Fantastic Thai that has forever changed my misguided views about difficulties of cooking Thai food. 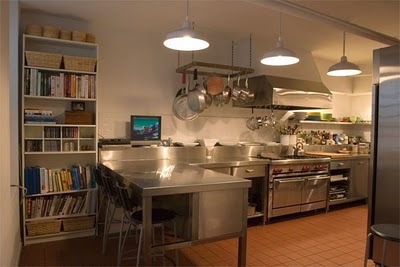 The class was held at KITCHENNYC located at 306 W.51st Street in Manhattan. There is no sign and if you have never been there before, all you would see is an apartment building. But look to the left and just before the entrance to the building there is a stairway leading down and directly into KITCHENNYC. It is a rather small space at just 450 square feet, which made for a very intimate class setting, but it is fully equipped and laid out very well. Fantastic Thai is run by Chef Phensri and her husband Darien. Phensri (pronounced PENSI) was born and grew up in Udorn Thani, Thailand where she started cooking at home at an early age and learned everything there is to know about cooking Thai food. She then came to the U.S. and put her knowledge into practice by opening a restaurant in New Jersey. 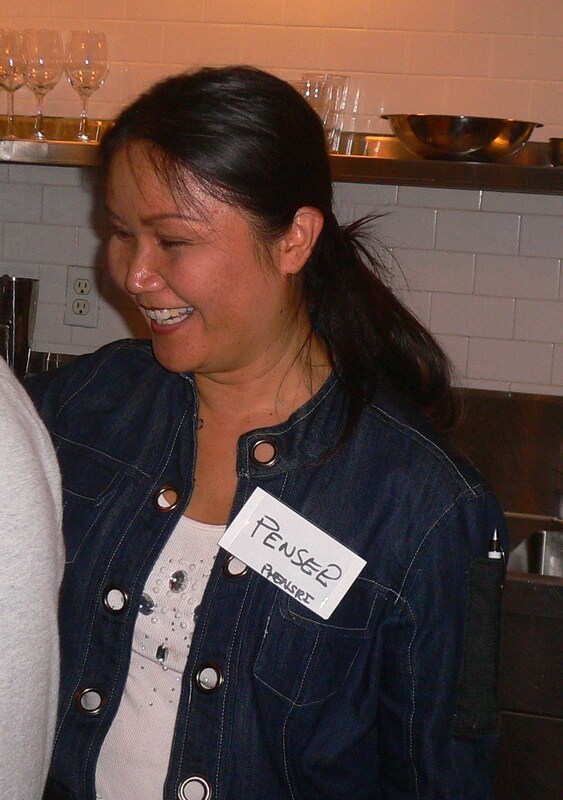 Not only does she have a restaurant, she also consults for other restaurants who want to serve Thai food, she caters for various events, and she teaches Thai cooking classes in both New Jersey and New York. In addition to all of that, she has created her own line of Thai cooking sauces that make cooking Thai food extremely simple and nearly foolproof! 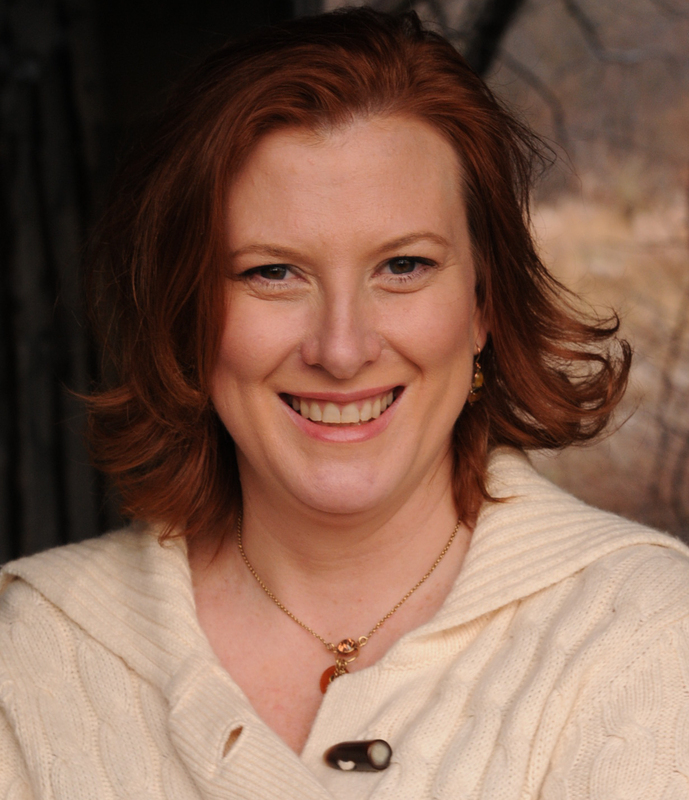 She has quite an amazing entrepreneurial spirit! She is also an incredibly fun and patient instructor! While English is not Phensri’s first language, she gets her point across and her husband Darien is right there to assist with anything you need. She has a small brass bell that she rings to get your attention if you become too distracted and are not paying attention. She doesn’t want you to miss a single detail! The night of my class, there was wine flowing and we were all happily busy with the prepping of our meal. 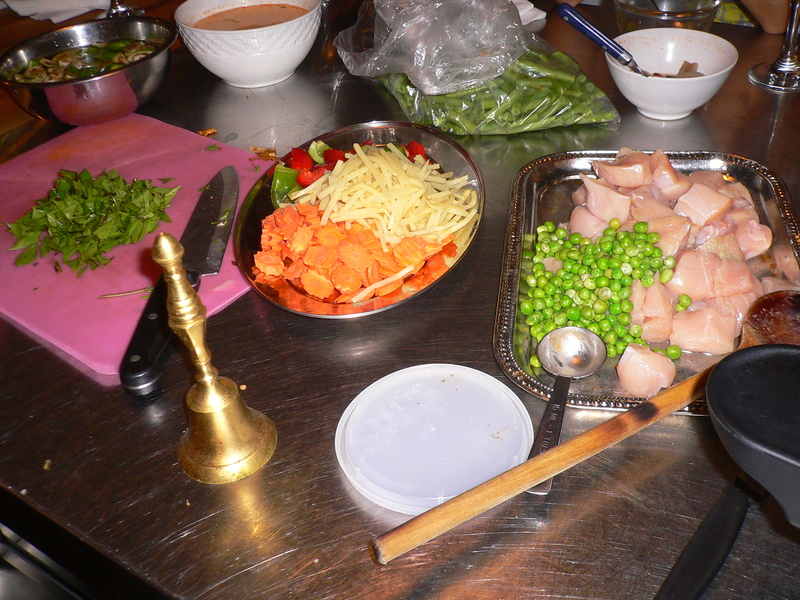 Each person had an opportunity to create a dish and also watch as the others prepared theirs. Since I went alone, I did not have a lot of opportunity to write down every step, but I was able to take a lot of pictures and at the end of the class, Chef Phensri gives out four laminated cards with eight of her recipes printed on both sides. 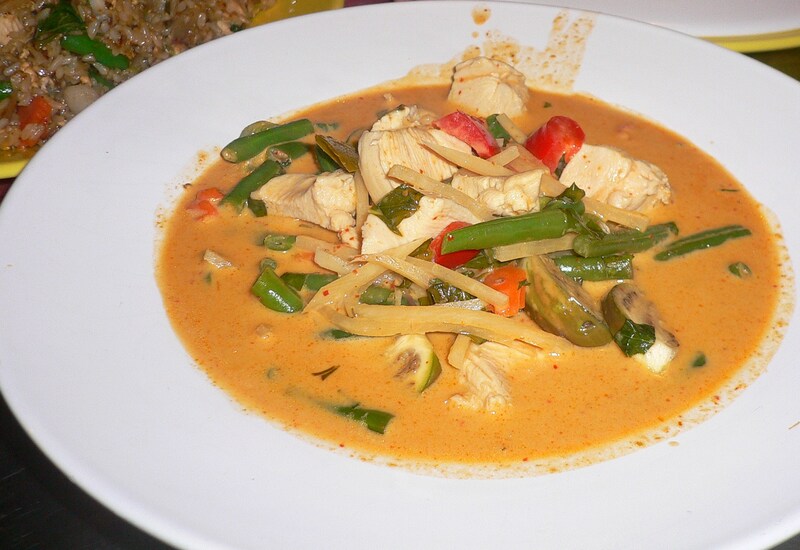 Each of the printed recipes uses either her Fantastic Thai- Magic Sauce or her Fantastic Thai- Pad Thai Sauce. These sauces make it very easy to recreate the dishes at home. But, if you wanted know what was in the recipes made without her sauce, you have to had been paying close attention in class! However, she is always willing to answer any questions after you leave the class, either by phone or email. You can also order her foolproof sauces here. We made a total of five complete dishes in our class. First there was Tom Yum Koong Soup which becomes Tom Ka Gai Soup with the addition of coconut milk. This soup is made fragrant with the addition of whole lemon grass stalks and Kefir lime leaves that Chef Phensri brought from her own garden. (Have to try to grow lemon grass in my garden next year!) There was also Galanga, a root much like Ginger, that gave off an incredible fragrance. The smell was so amazing while just the stock was simmering and even before any of the solid ingredients were added. Finished, it was a nice, spicy chicken soup that could surely cure any cold. I was tasked with making the Red Curry. First I gathered my mise en place. 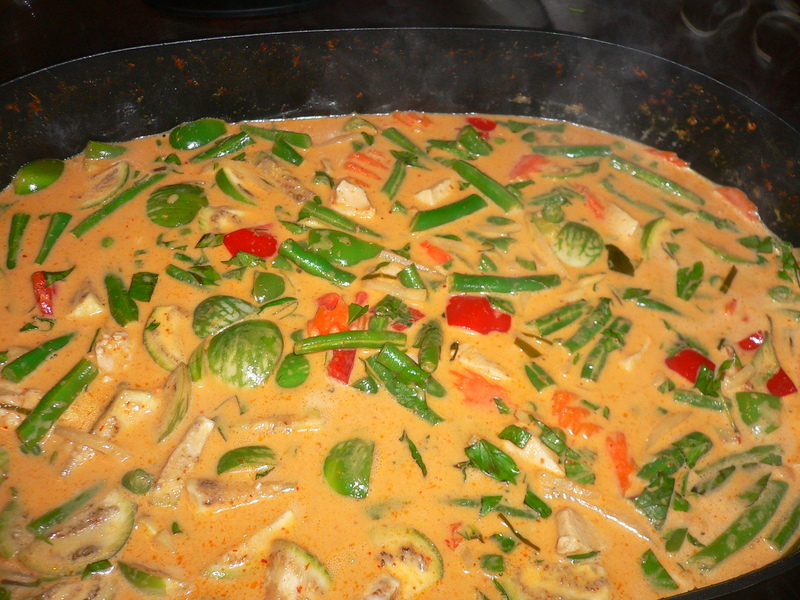 We used the brand, Maesri Curry Paste, Red Curry paste for this dish. There are many varieties and they all have different levels of heat and spice combinations. This particular brand of coconut milk is the brand that Chef Phensri recommends using in the recipes. 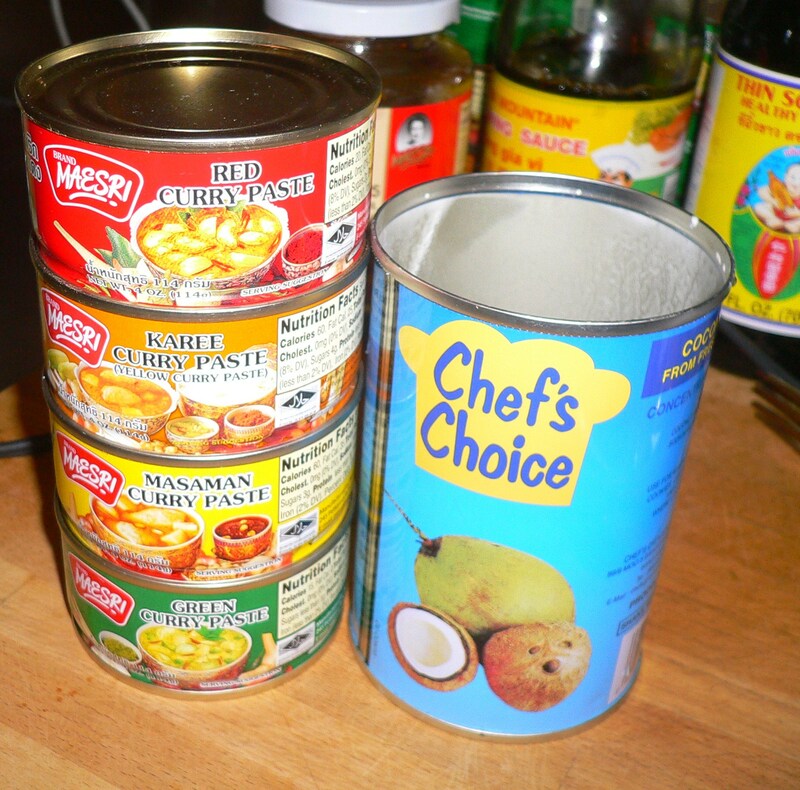 Chef Phensri thinks some of the other popular brands are too watery. 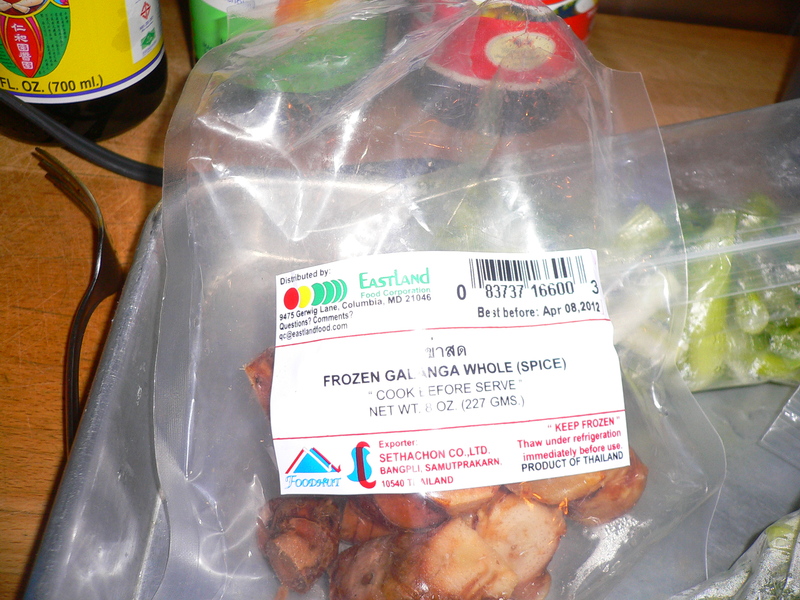 Among some of the ingredients was the Thai eggplant. This small, round eggplant is about the size of a golf ball and doesn’t seem to depart much flavor, but it is quite pretty and offers a bit of a crunch to the stew. Apparently, in Thailand, they only use them if they are fully white inside, but here, since they are much harder to locate, they are used even if they are brown inside. 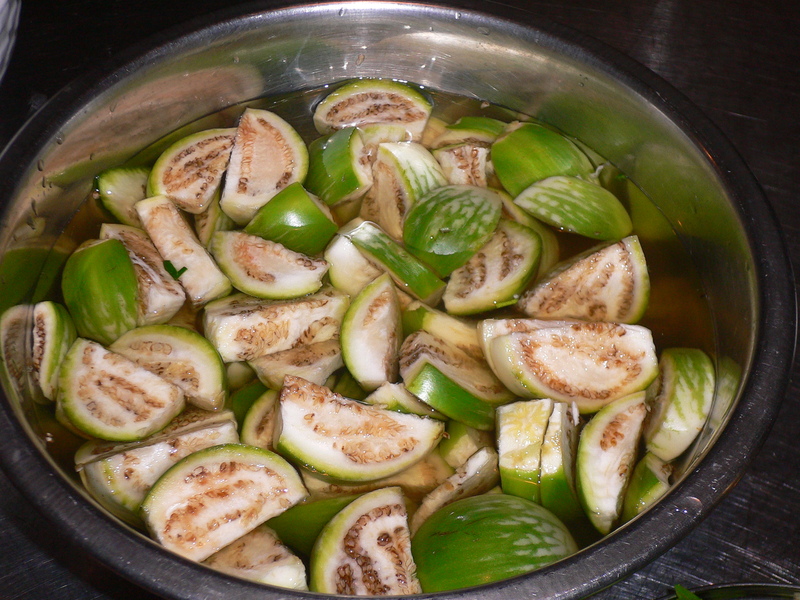 We cut them in quarters and soaked them in water to keep them from browning further. This curry was magnificent! The spice from the curry paste, combined with the sweetness of the coconut milk was in perfect harmony with one another. It was also bright and beautiful while it was simmering. I think this may have been my favorite dish of the night. The flavors were rich and complex, each bite sung with spice and sweet in a cohesive balance. Neither outdoing the other. It was perfect. 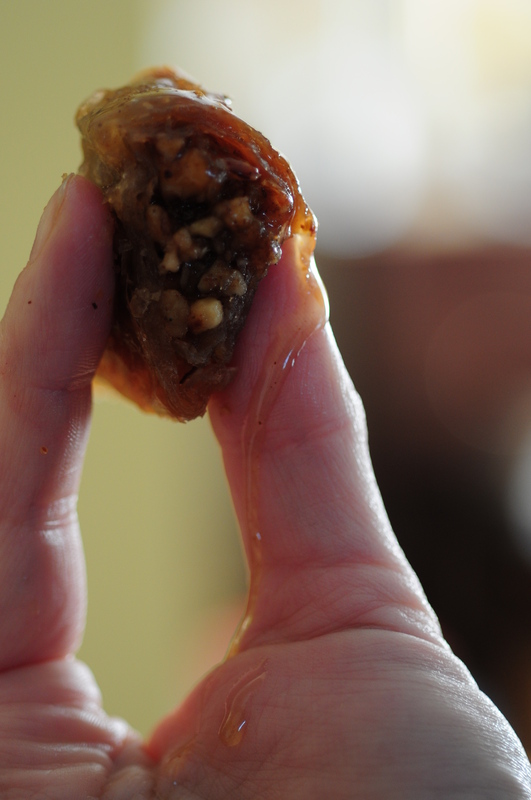 I have made this at home a few times since the class and with a bit of trial and error (using too much paste the first time- OMG HOT!) it is the stand out dish from the class and a new favorite in our house. The Beef Basil recipe was made in two strengths of heat, inferno and mild. I sampled the Inferno by mistake and took a bite of what I thought was a green bean, finding out quickly that it was a green chili! I ate quite a bit of brown jasmine rice and drank several glasses of water after that along with the nice lady next to me who did the exact same thing! We commiserate the heat, crying and sweating together. Once the fire was quelled, we both moved on to the mild version, the heat still resonating in our mouths. This hearty and quick dish was a hit amongst the classmates. We also made two versions of Pad Thai, one with shrimp and one with chicken. 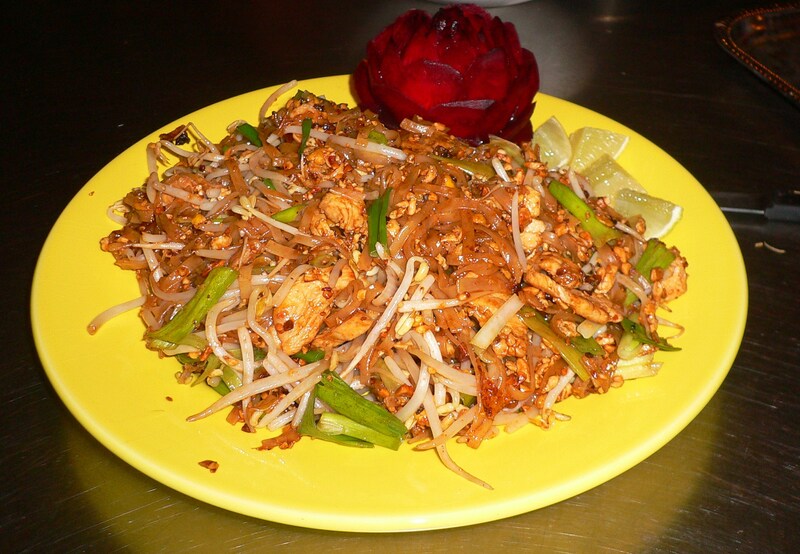 It seems that among Americans, Pad Thai is the quintessential Thai dish. There are so many different recipes for Pad Thai, but this particular one was delicious and one of the best ones I have ever had. Chef Phensri and Darien were kind enough to allow me to reprint it here for you to try at home. This recipe serves 2. About a half hour before you are ready to start cooking, soak the rice noodles in cold water until they are soft, drain and set aside. If you are making your sauce from scratch, combine the ingredients now and set aside. 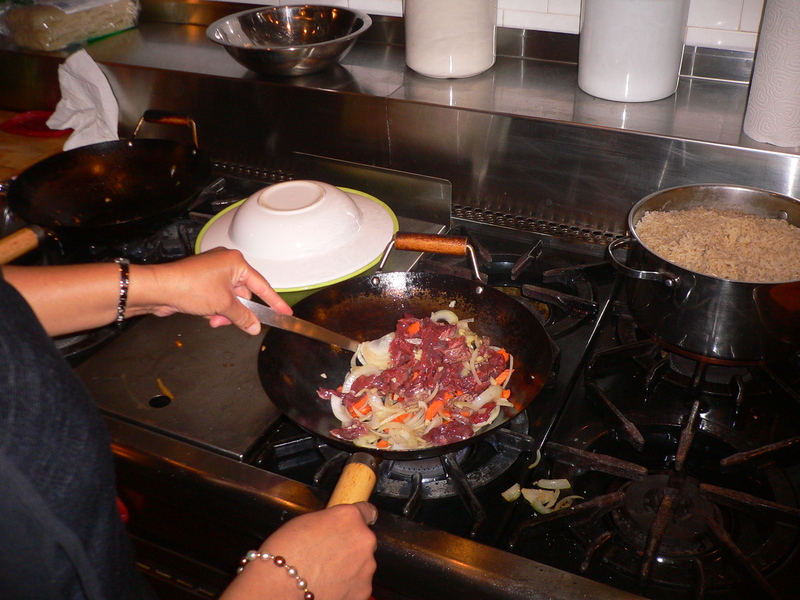 Heat your wok or frying pan over a medium high heat. Add the oil and move it around the pan to cover the bottom. Once the oil is very hot, crack your eggs into the pan. As soon as the egg begins to set, scramble into small lumps. Add the chicken and continuously turn it to cook through. Once chicken has cooked, add the rice noodles. Stir in the Fantastic Thai- Pad Thai Sauce or the homemade sauce and stir-fry to distribute the ingredients throughout the noodles and chicken. Turn off the flame, but while still hot, add the chopped scallion, roasted peanuts and bean sprouts. Immediately transfer to a serving platter and enjoy! If a more sour taste is desired, squeeze a slice of lime in your dish. Note: This can also be made with shrimp, beef, vegetables and tofu. If you are using seafood or tofu, you should add them after you add the noodles and sauces, since they do not need very long to cook. 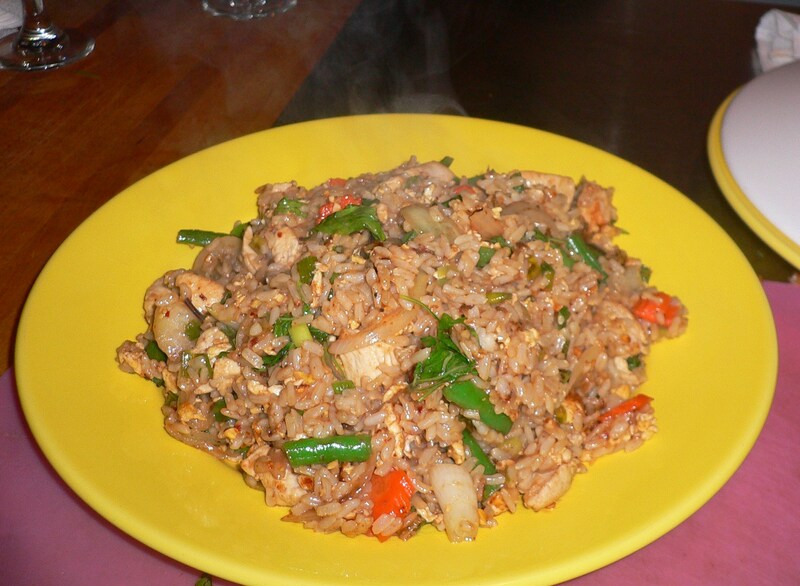 The class ended with a Classic Chicken Fried Rice. Once all the dishes were made, we ate together and shared some wine and lively conversation. We had our fill and the leftovers were divided among any participants that wanted to take some home. Then Darien gave a very informal pop quiz (you could cheat and ask the peanut gallery) about the different dishes we made and with the correct answers he presented us with personalized Cooking Class Certificates. 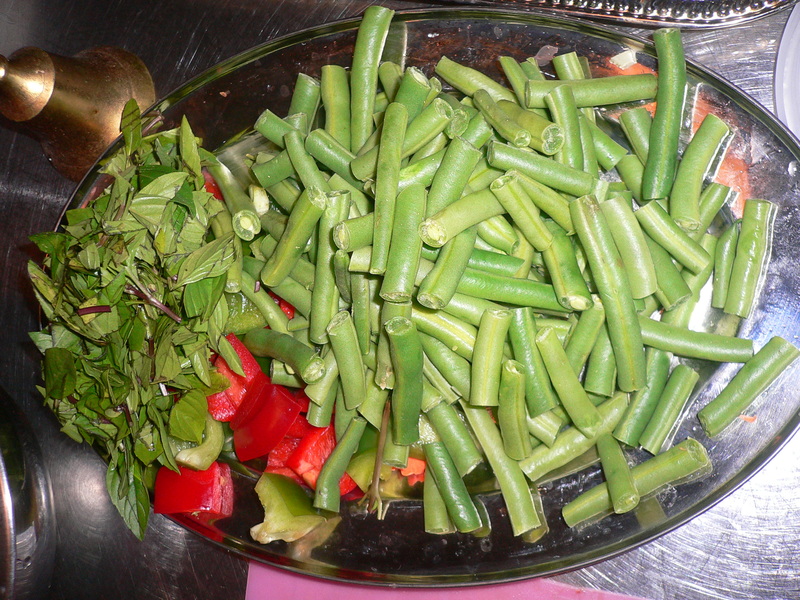 It was such a fun night out and I am happy that I learned how to make some Thai dishes with very authentic techniques. I would love to take more of Chef Phensri’s classes, especially with my husband. It would make a great date night. Bring a small notepad and pen so you can write down each of the steps and ingredients. Have some cash on hand to purchase some Fantastic Thai sauces and Kefir lime leaves. They are inexpensive and well worthwhile to purchase. You can bring your own wine, but you should bring enough to share! 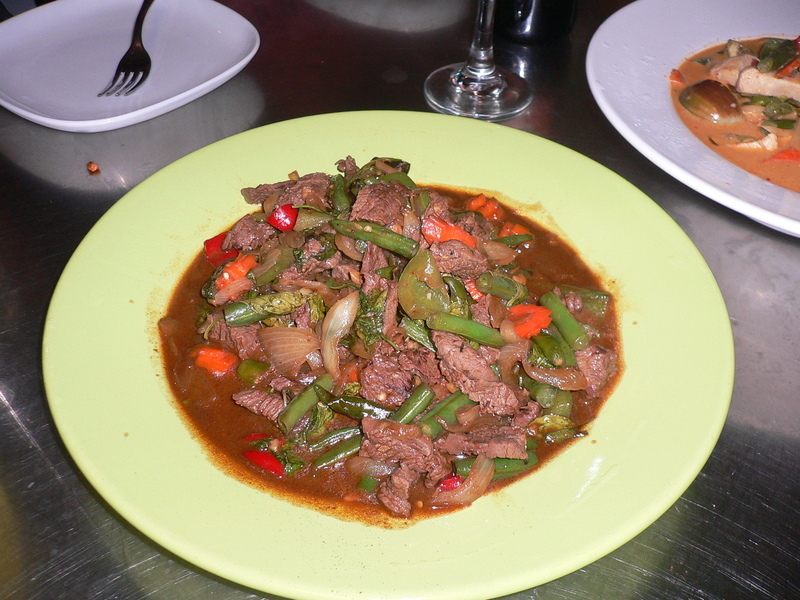 Chef Phensri and Darien can be reached at (732) 416 9267 or online at Fantastic Thai.